When my son was a little boy, we used to make Christmas cards together. I remember his first year in Nursery, and we made a card for every child in his class. All the mums gave us lots of praise for going the extra mile rather than just buying them! I used to get out some craft supplies like glitter, buttons, sequins, feathers, stickers and paints and let him create to his hearts content. Often drawing him a simple shape to fill in as he wished. It’s great to let children make Christmas cards for their friends and family, especially as it’s likely that they will be so proud of the end result! 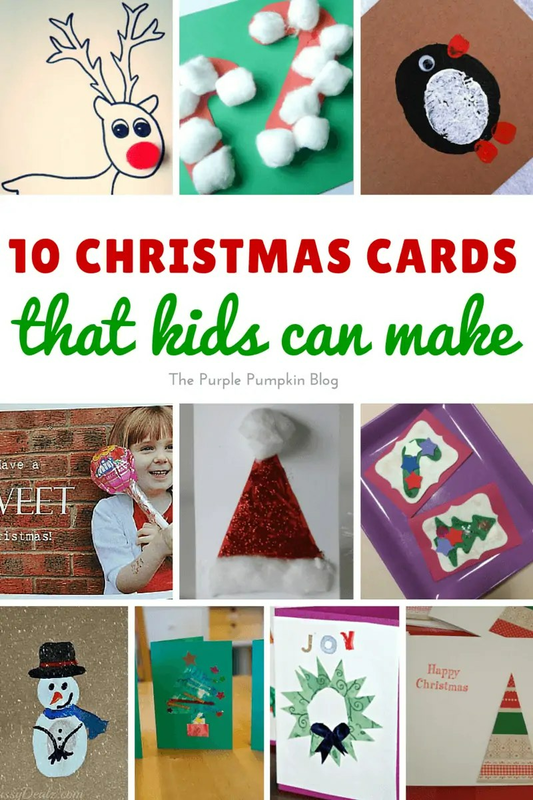 I’ve rounded up 10 Christmas Cards That Kids Can Make to give you ideas and inspiration to make cards with your children! Christmas, Crafts and For The Kids. Why not come and follow them?! Follow The Purple Pumpkin Blog’s board Christmas on Pinterest. Follow The Purple Pumpkin Blog’s board Crafts on Pinterest. Follow The Purple Pumpkin Blog’s board For the Kids on Pinterest.